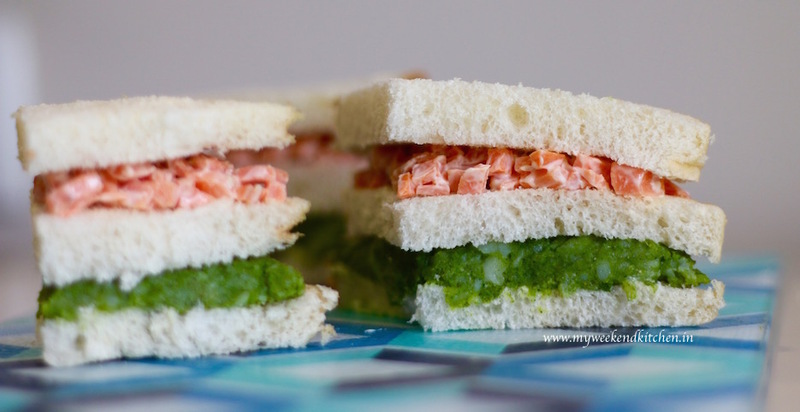 This tricolour sandwich is to celebrate the orange, the white and the green — colours of India. Every day is a great day to celebrate being an Indian, but Independence Day is a great day to share that pride with everyone. I made these tricolour sandwiches today for lunch as an early celebration and am going to make these again for a lunch gathering after the flag hoisting on 15th. It would actually be great to pack them for school a day before with a note on what each colour signifies. Independence Day evokes such fond memories of childhood — going to school all dressed up in the crispiest uniform, watching the tricolour unfold, singing the anthem and coming back with a bag of sweets :p. Ever since we moved out of India, we have tried to keep that tradition up by going to the embassy. I love looking up to our flag unfolding and the stream of flower petals coming down. Peel and cut the carrots into tiny cubes. In a bowl, mix the carrots with mayonnaise and a little salt and pepper seasoning. Keep aside. In another bowl, grate the boiled and peeled potatoes. Add in the green chutney and mix well. Take one slice of bread. Add the first green layer of potatoes mixed with green chutney. Top with another bread. Add the second orange layer of carrots and mayo. Top with the third bread. Cut into triangles and repeat with the second set of bread slices. I didn’t use cheese, but if you are making these for children’s lunch boxes, do indulge in a cheese slice in the middle of the sandwich. In this sandwich the second white bread make the layer for white colour, instead you can use a layer of grated cheese or paneer too.